The ACLU of Vermont has filed suit on behalf of a motorist who was stopped and had his car seized, leaving him stranded on the side of the road eight miles from his home in Rutland, because a state trooper said he smelled marijuana but otherwise had no evidence of a crime. At issue is not just an illegal traffic stop but whether police can continue to use a "sniff test" as evidence of a drug crime when possessing small quantities of the drug (marijuana) is no longer a crime. 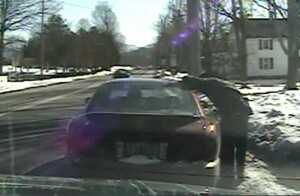 Rutland resident Greg Zullo was driving through Wallingford in early March when state Trooper Lewis Hatch pulled him over. The pretext for the stop was that a small amount of snow on the back bumper of Zullo's car was making the validation sticker on the rear license plate difficult to read. Hatch then said he smelled a faint odor of burnt marijuana around Zullo’s car. Zullo replied that he may have smoked marijuana within the last two or three days but not in his car. Hatch ordered Zullo out of the car and spent considerable time trying to get Zullo to allow him to search the vehicle, without a warrant. Knowing his rights, Zullo declined to waive them and refused the search request. Hatch was undeterred. He told another state trooper in a phone call caught on a video recording, “I can smell weed and he won’t allow me to search, so I’m just going to take it.” Hatch called a tow truck to take Zullo’s car to the Rutland state police barracks. Zullo asked for a ride home so that he wouldn’t have to walk the eight miles to Rutland, but Hatch refused. Once the state police had Zullo’s car at the barracks, they obtained a search warrant from the Vermont Superior Court by swearing that Zullo’s car smelled faintly of burnt marijuana and would contain evidence of a crime. Police searched the car, but only found a grinder and a pipe that they claimed contained marijuana residue. Zullo received no warning or ticket for any offense. The Vermont legislature de-criminalized small amounts (an ounce of less) of marijuana in 2013. The suit alleges that the state police violated Zullo’s rights against search and seizure under Article 11 of the Vermont Constitution. It is pending in the Vermont Superior Court in Rutland. Court filings in the case are available on our website. The video of the stop is available online.